A half-day adventure quad and camel! 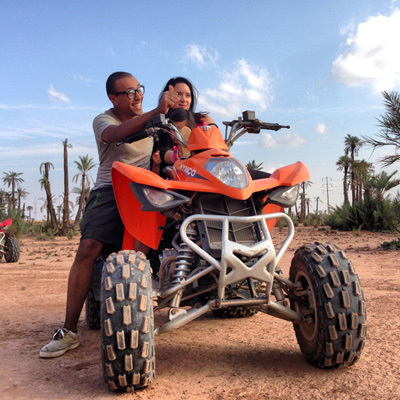 It begins with the ride of 2 hours quads in the desert of Marrakech palm grove where you will discover the age-old earthen houses and traditional hammams. In the middle of stone desert and rock the beauty of this barren landscape will seduce you. A pause Spare will be made at mid-term to cool off and drink the tea. We will then drive in the palm for the authenticity of a 1-hour ride by camel to discover thousands palms, wadis or Berber villages. You will feel in the shoes of adventurers! For the excursion on camelback, we provide a cheich, while for the ATV tour, we will provide all necessary equipment for your safety: charlotte, helmet and goggles.